Cracked, decayed, chipped or otherwise unattractive teeth can be repaired through several types of procedures, including direct bonding, dental veneers or dental crowns. The dentist will evaluate the extent of your cosmetic and/or functional defect in order to determine the appropriate treatment plan for your tooth. Direct Bonding for Minimal Flaws: Direct bonding may be the right choice for a minimally damaged tooth, particularly for a front tooth. While certain adults may be candidates for direct bonding, the process is the optimal restorative option for children under the age of 18. Also, the dentist may recommend a direct bonded veneer if you are including a dental/smile makeover in your treatment plan. Bonding for Significant Damage: Veneers may be recommended as part of a treatment for more significant adult imperfections and may be included as part of a smile makeover or cosmetic dentistry treatment plan. A porcelain veneer may serve as the material choice for bonding in a smile makeover case. Bonding for Large Imperfections: In cases where a defect cannot be repaired adequately with a veneer or through direct bonding, the dentist may recommend a dental crown. 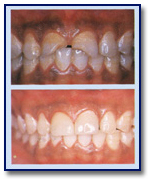 A crown can be attached to the tooth through the bonding or cementing process. 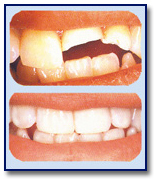 During the bonding process, the damaged tooth is isolated. Tooth isolation is critical to the success of bonding techniques because it prevents moisture from interfering with the process. Following tooth isolation, a gentle phosphoric acid (this does not produce discomfort) is applied to the natural tooth surface. This “acid etching” of the tooth surface enhances the bonding strength of the resin. After 15 seconds, the phosphoric acid is removed and a liquid bonding resin is applied. A putty-like composite resin is placed in stages on the natural surface of the tooth, where it is shaped and cured into place with a blue light. The process is repeated in layers until the resin has achieved its final shape and form. The bonding process is sensitive to each dentist’s technique, so the dentist must follow the steps diligently and produce an appropriate finish to ensure that the bonded resin does not fall off or cause tooth sensitivity. It is not uncommon for a bonded tooth to feel sensitive after treatment. This minor sensitivity is often short-lived; however, if sensitivity persists, it is recommended that you schedule a follow-up appointment with the dentist. Usually, the bonding process is not associated with complications.